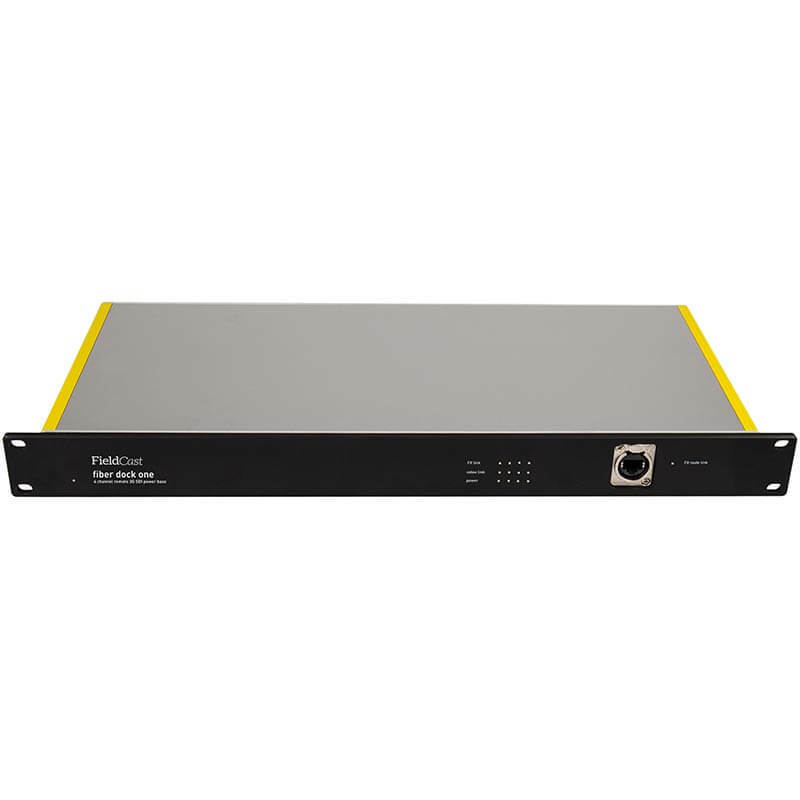 FieldCast Fiber Dock One is a four channel fiber optic converter designed for 3G SDI PTZ camera systems with ethernet control. If you want to go fiber with these the easy way, go Fiber Dock One. 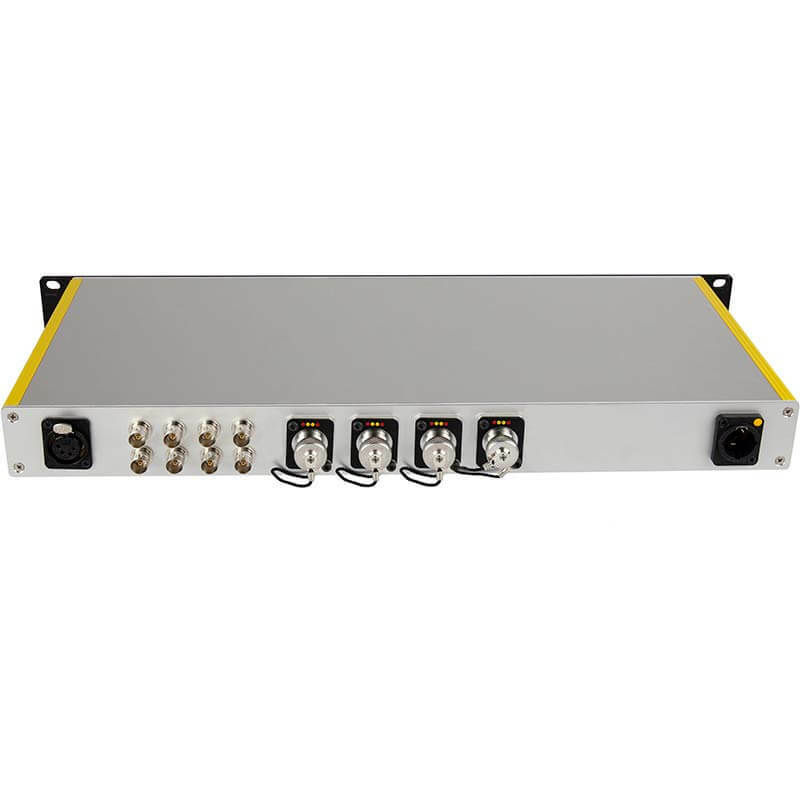 As a four channel solution it brings you four channels of 3G SDI output, so you can connect straight to your switcher or monitor, but instead of coaxial cable it uses fast and reliable fiber optic connectivity to transport the video signals generated by your PTZ cameras. 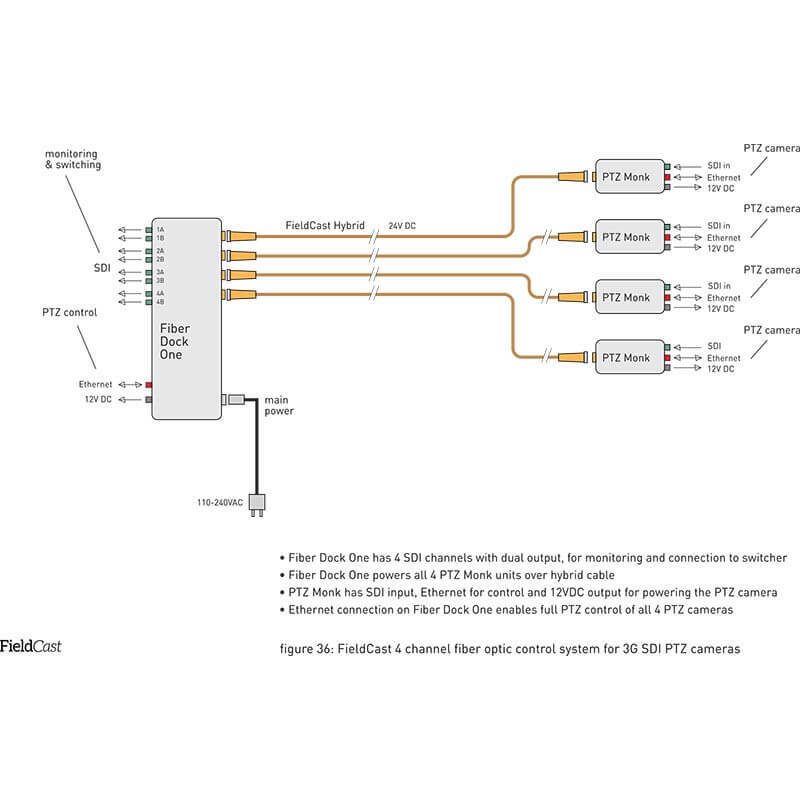 You can connect your PTZ controller directly to the ethernet I/O port of Fiber Dock One, and it will act as a standard ethernet switch between your controller and your cameras, but again, instead of copper cable it uses fast and reliable fiber optic connectivity to communicate with them. Furthermore, Fiber Dock One features a four channel 24VDC power supply to power all four cameras over the cable. For every channel, Fiber Dock One connects to FieldCast hybrid cable, and this light and robust cable contains two strands of fiber for data transport and two copper conductors for power transmission. Just imagine, each camera only needs one flexible cable to transmit uncompressed SDI video, control data and power. At the other end of each hybrid cable you only need to attach FieldCast PTZ Monk, a one channel fiber optic converter with 3G SDI input, ethernet I/O and 12VDC output. Once your PTZ camera is connected to FieldCast PTZ Monk, it can start up, it will listen to the PTZ controller you connected to FieldCast Fiber Dock One, and a video signal will neatly show up at one of the Dock's four SDI monitor outputs.